A tree-climbing, 200-pound bear with a taste for suburban amenities in La Cañada visited a YMCA, took a dip in at least two backyard pools, and kept concerned neighbors and authorities waiting while she snoozed on a tree branch, before finally scampering down and disappearing back into the wilderness Wednesday evening as personnel with bean bag rounds and tranquilizer darts held their fire. It turned out the 3-year-old female black bear is a repeat offender. The red tag on her right ear had been affixed two weeks ago after she staged another tree sit-in in Pasadena, being brought down in that case with a tranquilizer dart, according to California Fish and Wildlife officials. The bear had been transported to Mt. Lukens -- elevation 5,066 feet -- in the San Gabriel mountains, said Fish and Wildlife Lt. Marty Wall, but made her way into a La Cañada residential neighborhood Wednesday morning. Sheriff's deputies responded to a reported 10 a.m. sighting of the bear in the back of a home in the 4600 block of Palm Drive, which required crossing busy Foothill Boulevard to reach the destination. 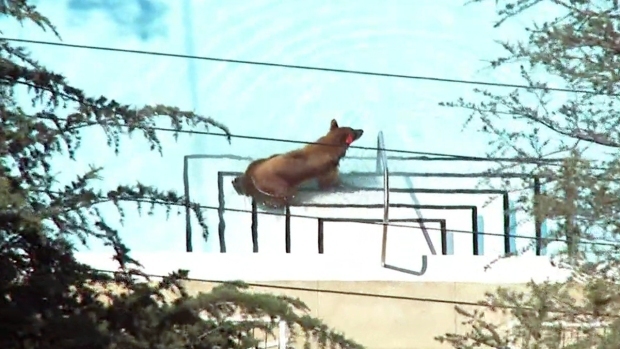 The bear, dripping with pool water, walked onto another property in the community about 15 miles north of downtown Los Angeles. The Los Angeles County Sheriff's Department reported several 911 calls about the bear. Department of Fish and Wildlife officers tracked her to the 1700 block of Lila Lane, where she waded into the shallow end of another pool. She traveled alone. Authorities learned from their first encounter with her that she had not given birth to any cubs. At one point, she headed up the driveway of the YMCA on Foothill Boulevard, startling a class for seniors who could see her through their window. Then she headed back north into residential neighborhoods with deputies in pursuit. In all, the bear covered at least two miles traveling through La Cañada Flintridge. It appeared the bear was headed to an undeveloped canyon and ravine area which leads back into the Angeles Forest. Wall surmised it was likely the route she had taken into La Cañada. But then she stopped on Jarvis Avenue, a cul-de-sac, and climbed one of its trees, just a hundred yards from the canyon. Given the closeness, Wall decided it would be best not to try to take down the bear with a tranquilizer dart, as done in Pasadena, but instead to wait her out. Deputies armed with less lethal bean-bag shotguns kept watch for her descent, prepared to urge her away from the neighborhood and into the canyon, rather than into the neighborhood. Tranquilizing has its own risks, with the drug requiring as much as 15 minutes to take effect, according to Fish and Wildlife's Andrew Hughan. "Tranquilizing doesn't work like in the movies," Hughan said. "Then, you have a frightened, scared animal with teeth and claws." Neighbors gathered to watch their ursine visitor, most approving of the "wait it out" plan, and expressing hope she would take the nearby shortcut back to return to the wilderness. "I certainly hope they don't hurt the bear," resident Megan Browne said. "We're in her neighborhood. We can wait." Treed bears often wait until the sun begins to set. On Jarvis Avenue, it was just before 5:30 p.m. when the napping bear began stirring, moving halfway down the tree, pausing, and then coming the rest of the way down around 6 p.m.
She looked at the Fish and Wildlife Lt. and the deputies, then headed toward the canyon and disappeared into its foliage, Wall said. 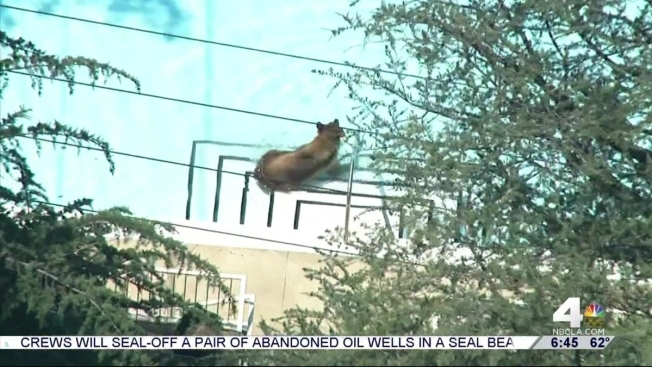 A bear took a dip in a La Canada Flintridge, California, swimming pool as police tried to locate it on Wednesday, June 8, 2016. Sightings are not unusual in foothill communities along the 210 Freeway adjacent to Southern California mountain ranges, especially on trash days when easy snacks are readily available in unsecured trash bins. "The 210 is pretty much bear central," Hughan said. "We want that bear to go back into open space or habitat." He said the helicopters overhead likely scared the bear and delayed her quitting the tree. There are signs that California's black bear population is on the rise in recent years, including sightings in areas where they were not reported 50 years ago, such as the Central Coast and Southern California mountain ranges, according to the department. Between 25,000 and 35,000 black bears roam 52,000 square miles in California.